After Cliff Lee's insanely studly performance last night, the Phillies, and Red Sox fans for that matter, look to 38 year old Pedro Martinez tonight in game two at Yankee Stadium. I'm not going to talk about his aging fastball, career success in New York, or even bring up that time he threw 104 year old and certifiably insane Don Zimmer around like a rag doll. We all know the Pedro vs the Bronx rivalry, but tonight is likely to be the last chapter. The Phils stunned the Yankees and their arrogant fans last night by getting out to an early lead and never looking back. In fact, by the later innings, with the score 5-0 or 6-1, multiple camera shots showed hundreds, if not thousands of empty seats. Now that's what I call a fan base. It's only the world series, you only paid 2,000 bucks for the seat, "It's Giardi's fault, we'll get em next time....now let's go get our swell on in the gym and drink protein shakes in our basements." Here's hoping Pedro comes out with his "Coming to America-like jerry curl, and can revert back to 1999 Petey for one last hurrah in NYC (ITM side note: odds that he actually gets shelled tonight is currently about 2 to 1). J Roll: "Phillies in 5"
Immediate disclaimer: I want the Phillies to beat the bag out of the Yankees in the World Series as much as you do. There is a difference between cocky and confident, joking around and being serious(see Dustin Pedroia), but J Roll is just J Roll. That is, he's a loud-mouth player whose name is bigger than his career numbers. Two years ago, he had a great season, however, prior to and since then, he's been a relative disappointment (hitting .250 in 09', .274 in his career). Yet he talks as if he puts up Pujols numbers. Pedroia wouldn't even jokingly say the things J Roll says with a straight face, now that's bad. The three of us who write for ITM scrambled this evening to meet the AL MVP voting deadline, submitting our ballot to the Baseball Bloggers Alliance (BBA). We still have differences in the exact order of the top ten, but the list below represents a little bit of compromised on all sides. Perhaps the biggest difficulty was keeping Jason Bay off the list, and listing two Yankees ahead of Youk.....our attempt at "fair and balanced". A press release from the BBA is due out tonight, showcasing final votes. It's going to be interesting how closely, or completely far off we all are from the baseball writers association. News broke yesterday that the Red Sox have a standing offer to former Blue Jays GM J.P. Ricciarddi. Sure, he's a Worcester boy, was a Sox fan growing up, and has a great last name (in my book), but I really hope the Sox don't give him much responsibility. Riciarddi spent eight years in Toronto, trying like hell to make the Jays relevant in the best division in baseball. A division that also has two teams with some of the highest payrolls in baseball. While in the Great White North, Ricciarddi struggled to expand payroll, sign the right players, and put together the right balance of pitching depth and quality hitting. He is best known for two outrageous deals to Vernon Wells (still owed well over 100 million over the next 5 years), and Alex Rios, a player who they rushed to make their franchise cornerstone, only to have to ship him to the south side of Chicago after a horrible year. (ITM note, I wasted a high pick on Rios for my fantasy league, I was drinking the cool aid as well). Wells and Rios aside, Ricciardi was highly criticized for his handling of the recent Roy Halladay discussions, with many GM's calling his demands completely unreasonable. After letting other great starters go, he had a chance to completely reshape his team for the future and provide some direction. Instead, he's left the team no better off. And don't even get me started on the Frank Thomas deal. Talk about signing a real tool bag. Over the years, he's been close to competing, but has managed to fumble it in the red zone with terrible financial decisions that ultimately handcuffed his flexibility. 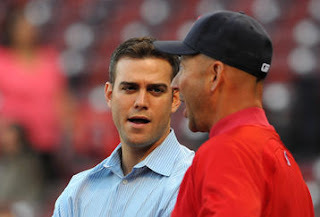 In the end, I want to like this guy, and perhaps he was never given the right (or enough tools), but if Theo brings him to Boston, they better keep him clear of the payroll, or any significant responsibility. PS: if my fantasy football team doesn't win today, I'm going to start a blog about how terrible the "Naked Bootleggers" are. Man up. 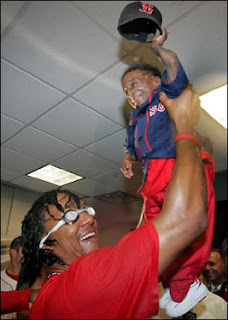 Tell Me Again How the Sox Lost to this Team? Turns out, even in Canada baseball doesn't make sense. I'm currently watching the Angels fall apart like the Yanks did in September last year. The worst part? I'm in Toronto for the week where people are more concerned with hockey and the CFL than baseball. I'll give the Yankees all the credit in the world, they can mash and have been getting great pitching. But the exciting Angels offense, great starting pitching (save for Lachey and a horrible call tonight that changed the game), and bullpen that shutdown the Sox isn't there. They're not the same team, which only upsets me more about the Red Sox ALDS loss. Which continues to highlight the fact that baseball is a fickle game that simply can't be explained sometimes. Time for a comeback is still there. But I'm quickly becoming a short term Phillies fan. PS: Soxin09', I'm currently out of the country, insanely tired, but still blogging from my B-Berry, see how much I poured??? As a team, the ITM writers are not ready to post about the ending of the Red Sox season. We've sent along multiple emails, confirmed that we've all gone back to work and are continuing our somewhat normal lives, but any Red Sox related post out of us at this point would still be completely irrational and full of anger. That said, as a member of the Baseball Bloggers Alliance, ITM, along with fellow Red Sox bloggers The Joy of Sox and Boston Red Thoughts, have been asked to submit their ballots for seasonal awards. Once tallied, the results will be made public via a press release sometime in the next few weeks. 1- Andrew Bailey - Oakland's new studly closer shut down 26 games out West for the A's. His 1.84 era, sub 1 WHIP, and 91 strikeouts in 83.1 innings pitched wraps up the award for him in our mind. 2- Rick Porcello - Got 14 wins at the tender age of 20 for a Tigers team that completely imploded down the stretch. His upside is huge, but at times this year he struggled to find consistency. He got extra points for being on my fantasy team. 3- Jeff Niemann - Two or three months ago I would have said Ricky Romero needs to be on this list, but the fact of the matter is Romero faded significantly down the stretch while Niemann got stronger. Niemann figures to a part of the forever young Rays rotation for a long time to come. It's a good thing I can't sleep well as a result of the Sox.....and the stress of my graduate program's workload....because it's 9am, the lineups are out and the players are taking swings in the cages. What boggles my mind more than that, is that it's 6am in LA, lineups are out, and most of the Angels fans are probably still dreaming about their terrible screenplays being picked up. The only real change is flipping J-Bay and Ortiz, with Scott Kazmir on the mound. Our old friend from Tampa is 6-4 with a 3.05 ERA in 13 career starts at Fenway, all with the Rays. He's thrown the ball well for Anaheim in what's turned out to be a fantastic deadline move. This was not how it was supposed to go. All year, we maintained this team was built for the playoffs, and they still might be, but as of now, the 2009 Red Sox have a lot of convincing to do. They're coming home from the make-believe land of Southern California, tail between their legs, but not totally defeated. The players are saying the right things "it's not over, we've got a lot of baseball in front of us" - Dustin, I can't hit a thing, Pedroia, and "I welcome this kind of responsibility" - Clay, don't blow it, Buchholz. I can assure you however, that Red Sox Nation, at least the non pink hats, are waking up this morning with an empty feeling in their stomachs. That same feeling that makes typing this such a struggle, it's the concern that after coming this far, stressing this much, pouring it all out for this team, the Sox are not who we thought they were. Through two games (the most important of the year I may add), they've looked like the Red Sox of early August. They've thrown out their two big studs, and not that they pitched poorly, but they have nothing to show for it. TMurph called it a few posts back when he voiced his concern that this team hasn't shown it can hit good pitching.....spot on, even he has to be right once in a while. Don't blame the umpires, don't blame Beckett or Lester, don't blame Tito or even Theo, blame the terribly inconsistent lineup. Blame the fans and the media for completely overlooking a talented Anaheim team, who we thought somehow would disintegrate because of past playoff performance. The worst part may not be the fact that the Sox are down 2-0, it's that the Yankees are up 2-0 and doing it in fine fashion. Combine the two and you have the worst of both worlds, loud-mouthed Yankee fans who are only good for fist-pumping on the Jersey shore, pounding their chests and rubbing it in at every chance they can....and "blow it up" Red Sox fans who all of a sudden "knew this team was terrible" and want Theo to be fired. So far, the playoffs have been turned upside down, with the Sox being silenced by the Halos, and Arod actually hitting the ball in NYY. There is still time for things to right themselves, but if they don't do it quickly, be prepared for a long, long off season. Behind the Plate Tonight, the Worst Umpire in the League...No Joke. Clearly safe right? I nearly flipped the coffee table over last night after two piss poor calls from CB Bucknor....aka, the worst umpire in baseball. I'm not even making this up: in multiple surveys of 400 different MLB players over the past few years, Bucknor was overwhelmingly voted the worst in the game. I honestly don't know how Youk didn't flip out and power bomb the guy after those calls. So this is exactly the guy you want behind the plate calling a very important ALDS game right? Unbelievable. You can feel the tired anger in the financial district today....it was only game one, but it was such a frustrating game, from only mustering 4 singles, to terrible umpires, to Torii Hunter going bazerk, it was rough. As a result, tonight's game becomes as close to a must win as possible. Let's all hope Beckett bounces back tonight....because alliteration tends to win ball games. I'm convinced of that. Somewhere in Needham, I can hear Tommy Heinsohn screaming "Big Bang Boom Beckett! ".....that was terrible. Ok, Go Sox. Okay, so that title's not entirely accurate. It's more of an ITM anxiety preview. I'm worried. I'm sitting here with a glass of whiskey neat - what should be a warm treat on a crisp October night. But undeniably, this is just medicine for my nerves. There's nothing pleasurable or autumnal or old-fashioned about this drink. It might as well be robitussin going down my throat. Were you aware that the Angels hit 15 points better than the Red Sox, with a league-leading .285? Or that they had as many hits as the Yankees - over a hundred more than the Red Sox? That they actually were right around the league average in walks, something the old Angels never even approached? Or how about that they actually struck out fewer times than the Sox? I used to calm myself by noting that they were the free-swinging Angels, a strategy that never worked in the cool twilights of October. That was then. Now I'm looking at pregame clips of Bobby Abreu. The man travels between Venezuela and the U.S. on an ocean liner, that's how patient he is! But we've got Jon Lester and Josh Beckett and a hell of a bullpen. I try to tell myself that a few times every minute. And we've got J.D. Drew. Don't ask me how, but I've convinced myself that he's gonna be the hero this series. It must be the whiskey writing. I'm not sure how many more Octobers I can take. I profess to love all these chilly thrills, but really, I'm sort of a dog-days kind of guy. I like the slow pace of baseball. The oh-well-there's-always-tomorrow attitude. The statistical evening out. These games count. How am I supposed to handle that? I'd say that about sums it up. It's gonna be a long ALDS. Okay, couldn't help sharing a few of this morning's headlines to get you ready for the evening matchup. This is just a glimpse into what it's like waking up in the heart of Yankee-land every day. Boston's pitching was an absolute roller coaster ride this year. From having too much, to having too little, the one constant was either Beckett or Lester playing the role of the ace and helping the Sox through it. The front end of the rotation deserves an A-, while the back end (Smoltz, Penny, and Byrd) earned a C- at best. This would be an A if it weren't for Manny Delcarmen's inconsistency. The best bullpen in the has been predominately solid, and with Papelbon looking stronger than ever, he might not give up a hit in the postseason. Jason Bay, Vmart, Youk and Jacoby aced the course. However, the cold stretch which made me freak out during my honeymoon in August docks their grade, with Tek and Lowrie also dragging down the class mean. Jacoby and Gonzo have been going above and beyond. The grade has been increasing as the season bore on, however Youk has been the rock throughout. On the flip side, Lowell has been the damaged goods as his surgically-repaired hip has severely diminished his range. We were thinking about it, and couldn't come up with of many instances where we completely disagreed with Tito this season. Given the tough environment, turnover, etc, he's done a bang up job. It's been a tale of two seasons for the boy wonder, the preseason moves, and the mid season moves. ITM deserves the right to change this to an A+ if the Sox take home the title. His mid season transactions have yet to fully show their value. Overall, this team is hovering around an A-/B+ average, which is nothing to sneeze at....but there are still points on the table to be had. Here's hoping for an upward revision to a hundy spot come early November. C70 At the Bat: What are the Sox Strengths going into the playoffs? ITM: The strength of the Red Sox heading into the playoffs is its' starting pitching. 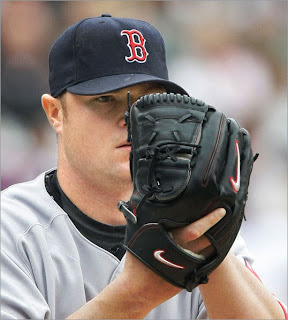 Many across baseball, in especially here in Boston, believe we have two number 1 starters in Josh Beckett and Jon Lester. There has been questions about each players' health after Beckett was scratched from his last start and Lester took a line drive off his knee/quad in NY last weekend. Lester will start tonight and Beckett on Saturday, presumably meaning Lester will start game 1 of the ALDS. Couple that with Clay Buchholz and Daisuke Matsuzaka pitching well down the stretch and one would assume this team goes as far as their starting pitching takes them. I would also consider the bullpen a strength of this team with 3 power arms in Bard, Wagner and Papelbon. Lastly the veterans on this team and playoff experience can't hurt. The majority of this team went to game 7 of the ALCS last year, and another high percentage of those players won the World Series in 2007. Players like Ortiz, Becket, Pedroia and Youk have been around the block in October before. C70 At The Bat: A few things worry you about this Sox team? ITM: First is their lineup's ability to hit good pitching. The addition of Victor Martinez in the middle of line up definitely makes them more formidable, however in game 7 of the ALCS in 2008 they scored 1 run and lost 3-1. Matt Garza shut them down in that game and Zack Greinke shut down the Sox last week in KC. The Angels pitching staff doesn't worry me as much, but pitchers like Sabathia and Verlander can definitely quiet the Sox bats. Secondly, the health of some key players worries me. Mike Lowell got a cortisone shot in his hip yesterday and Josh Beckett had a back spasm which was reported as minor but still kept me up for a few nights. C70 At the Bat: Any roster moves or surprises expected with October changes? ITM: I'm not sure that there will be any surprises either way if someone is added or left off the Red Sox playoff roster. The veterans on this team and the stars will all be there. The way Manny Delcarmen has pitched lately it wouldn't be shocking if he's left off the roster in favor of Paul Byrd being the emergency long man out of the pen. Delcarmen has been able to get left handed batters out, but that is about it. The last positional spot would probably go to Joey Gathright or rookie Josh Reddick. Gathright offers more speed off the bench (the Dave Roberts comparisons have been unavoidable here in Boston) but Reddick is probably better overall and gives Terry Francona an extra outfielder. Jacoby Ellsbury was instrumental in the Sox winning the 2007 World Series as a rookie. C70 At the Bat: Who is the one key player for the Red Sox, the player that if they don't go well, the Red Sox will be home quickly? ITM: If Josh Beckett isn't healthy or continues to pitch more like he did in August then he did in June and July then the Red Sox will be lucky to beat the Angels. If he pitches like he did in 2003 or the 2007 playoffs the Sox could very well be celebrating their third championship this decade. C70 At the Bat: What are the expectations for this team? Is anything less than the Series a disappointment? ITM: The expectation every year in Spring Training is for the Red Sox to compete, if not win the World Series. I believe this team has the talent to win it all this year, but I'm not sure I would call it a disappointment if they didn't win the Series. If the Angels sweep them out of the first round that would be considered disappointment in my book, but any kind of success in October is something to hang your hat on. We've become very spoiled here in the New England area this decade and have come to expect championships year in and year out; but these things are as much luck as they are talent. Jon Lester is no sally, a little line drive off his leg isn't going to stop this man from dominating lineups for as long as he wants. I mean, the guy beat cancer, did we honestly think he wouldn't spin a great game against a defeated Cleveland team? Last night, he put to bed any injury concerns by providing another ho-hum gem. Sadly, we've become so spoiled by Lester that anything other than dominance is questioned. A few buddies and I went to the game last night with expectations of a great pitching performance, we certainly got it, but we expected nothing less. He would get two strikes on a batter and we would already be getting up to get in the beer line since we knew Lester would ruin the hitter for strike three (ITM note, we definitely had a few too many trips to the beer line). He's turned into one of, if not the best left-handed arms in the league right in front of our eyes. He's leapfrogged over perhaps the best post season pitcher of our generation to start game one of the upcoming ALDS, and none of us blinked an eye. Maybe it was the beer consumption, maybe it was the October bite of cold in the air, but last night's game sent me to another level of excitement for baseball's playoffs. If Beckett is able to throw up goose eggs and strike out 9, I might not sleep until game one of the ALDS next week.